Feeding my toddler can sometimes feel like a battle. And I'm losing the battle. Though my older children can polish their food faster than it takes me to make it, my toddler seems to balk at anything that I offer her. Recently, I saw visual samples of the amount of food a toddler should be eating per meal and it make me feel much better. Toddler's stomachs are the size of the fist, so while compared to my older children it seems she eats nothing, she is probably getting all the nourishment she needs. And for those days when it seems she is refusing anything, I try to follow some of the toddler picky eater tips from experts. Make eating routine. Set specific times for eating and snacking. Do not allow grazing all day. You don't want them to fill their small stomachs on sweets or cookies. Her last snack time should be two hours before dinner, so she has time to build up an appetite. Keep trying. If your toddler refuses to try a new food don't give up. 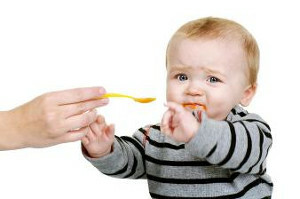 Most toddlers will not try new foods the first time they are exposed to it. Next to the chicken and pasta you know that they will eat, try putting on a serving of vegetables. After a few times they may surprise you by eating it. Make it fun and easy. Cut the food up into bite size finger foods. Use fun cookie cutter shapes to make it more interesting. Toddlers love to dip their food, so think ketchup for chicken or yogurt for vegetables. Sometimes the problem is their lack of attention span. Make sure to use their table time wisely by filling them up with good, nutritious calories. Try potatoes, cheese, chicken, eggs, yogurt and pasta. Give them a new fruit or veggie when they have friends over. Carrots can be X-ray Vision Carrots. Isn't it cooler to eat that than regular carrots? Let them be involved. When shopping ask them what fruits, vegetables and healthy food they like. If they were the one to buy it, they may try it. You can also have them help you prepare the meal. They will be more willing to try something that they made themselves. Set a good example. Don't eat on the go. When eating out together, show them how you are willing to try new foods. Give the food a cool name. Carrots can be X-ray Vision Carrots. Isn't it cooler to eat that than regular carrots? Make sure they are comfortable. If they can't reach the floor or sit back against their big size chair, they will want to leave the table much faster. Invest in a toddler table and chair set or booster seat to ensure that they are comfortable. Serve small portions and let your child ask for more if needed. You do not want to overwhelm him with too much food. If all fails do not despair. Some days they may gobble up everything you hand them and on other days it may seem they are not eating anything. Give them plenty of fluids and let them guide you on how much they need to eat. When they are hungry, they will eat. Miriam Seitler is mother of 4 adorable children who lives in New Jersey. She is the owner of UltraQuirkyTot.com, a website for just toddlers. Check out their fabulous line of toddler clothes and accessories, educational toys, kids room decor and toddler gear.